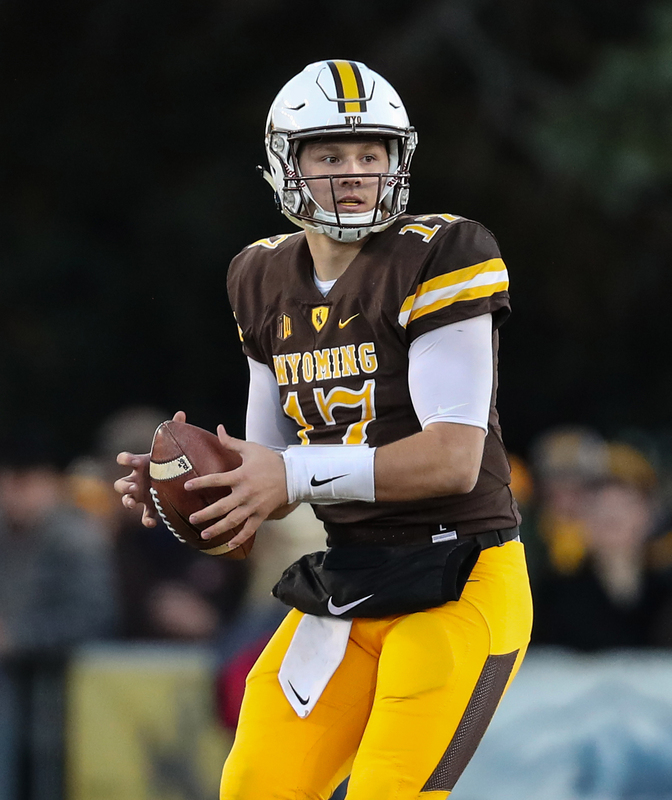 It’s been long expected that star Wyoming quarterback Josh Allen was going to enter the 2018 NFL Draft. Following the team’s game on Nov. 18, head coach Craig Bohl all but confirmed the speculation. The coach’s comments weren’t the only indicator about Allen’s future. The junior quarterback was also the first player honored during the team’s senior-day ceremonies. Bohl played that off by saying, “Well, Josh is set to graduate and (is) a senior,” alluding to the fact Allen is an academic senior. So far in his junior campaign, Allen hasn’t put up the eye-popping stats many expect from a first-round quarterbacks, amassing 1,658 yards, 13 touchdowns and six interceptions while completing just 56.2 percent of his passes. Scouts, however, rave about the signal-caller’s tools. At 6-foot-5 and 230 pounds with a cannon for an arm, Allen is seen by many as the most physically talented passer in an impressive class of quarterbacks that includes USC’s Sam Darnold, Louisville’s Lamar Jackson and UCLA’s Josh Rosen. Teams who could be a possible destination for the Wyoming product include the Giants, Browns and Jets. Per usual, Bleacher Report’s Matt Miller had several notable opinions and hot takes in his weekly column, led by a debate on whether Ezekiel Elliott is the best running back in the NFL (the writer ultimately surmises that the title belongs to Le’Veon Bell). Penn State running back Saquon Barkley‘s draft stock continues to climb, as Miller claims that the offensive weapon could end up being a Le’Veon Bell–type player. Meanwhile, the writer declares that Wyoming quarterback Josh Allen is the top signal-caller in the 2018 draft. Speaking of draft prospects, Miller is rather enthusiastic about the talent on Clemson’s football team. The writer believes that defensive tackle Christian Wilkins, defensive tackle Dexter Lawrence and defensive end Clelin Ferrell all have potential to be top-1o picks, although it’s worth noting that Lawrence won’t be available until the 2019 draft. While Aaron Donald showed up to Rams mandatory minicamp, the defensive lineman is still seeking a brand-new contract. Miller believes the former first-rounder will ultimately become one of the highest-paid players in the NFL once he signs an extension. Miller also notes how Texans offensive lineman Duane Brown and Panthers tight end Greg Olsen are also seeking a new deal. The four-year deal for Chargers linebacker Melvin Ingram is “news you should take note of,” said Miller. The organization now has the former first-rounder and Joey Bosa locked up for several years, creating quite the formidable (and youthful) defensive front. Bob Stoops suddenly announced his retirement as the head coach of the University of Oklahoma, shocking the NCAA. Miller notes that the 56-year-old could be in line to replace John Fox if the Bears decide to look for another coach next offseason, although the writer notes that Jeff Fisher could be another candidate. Charles Sims will be making his return this weekend. Greg Auman of the Tampa Bay Times reports (via Twitter) that the Buccaneers have activated the pass-catching running back from the injured reserve. The team has also promoted wideout Donteea Dye, and they’ve waived offensive lineman Josh Allen and defensive tackle John Hughes to make the necessary roster room. The Buccaneers’ running backs have struggled through injuries this season, as the team has relied on four different starters at the position. Despite the woes, Tampa Bay has still managed to run for a respectable 1,259 yards. The team should be optimistic heading into the final stretch of the season, as Sims, Doug Martin, Jacquizz Rodgers, and Peyton Barber are all finally (relatively) healthy. Of course, running back Antone Smith is currently on the injured reserve. Sims was placed on the injured reserve in early October with a knee injury, and he returned to practice in late November. In four games this season, the 26-year-old had run for 116 yards and one touchdown on 41 carries, and he added another 14 receptions for 112 yards and a score. 2015 was a breakout campaign for Sims, as the former third-rounder finished the season with 529 rushing yards and 561 receiving yards. With wideout Adam Humphries sitting out this weekend’s game with a concussion, the Buccaneers also promoted wideout Donteea Dye from the practice squad. As an undrafted rookie in 2015, Dye ended up playing in 10 games (five starts) for the Bucs, collecting 11 receptions for 132 yards and one touchdown. Hughes was playing for his third team this season, as the veteran defensive end has also spent time with the Browns and Patriots. 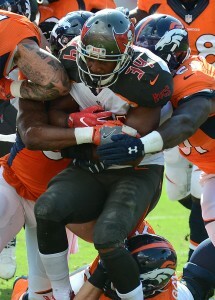 The lineman ultimately played in five games for the Buccaneers, compiling six tackles. Hughes has 58 career games under his belt, and he’s collected 115 career tackles and 5.5 career sacks. Allen was promoted from the practice squad to the active roster in late November. The center played in three games for the Buccaneers back in 2014. Auman believes that the release of Allen is an indication that Evan Dietrich-Smith could return from his three-game absence. It’s been a busy day for the Buccaneers, as the team lost a player on both sides of the ball. The organization announced that cornerback Jude Adjei-Barimah has been suspended four games for violating the NFL policy on performance enhancing substances. Meanwhile, Rick Stroud of the Tampa Bay Times reports (via Twitter) that the Buccaneers have also placed offensive lineman Ben Gottschalk on the injured reserve. Cornerback Javien Elliot and offensive lineman Josh Allen have been promoted from the practice squad to take the open roster spots. With Adjei-Barimah out until at least December 19th, the team will likely rely on Alterraun Verner and Josh Robinson to spell starters Vernon Hargreaves and Brent Grimes. Gottschalk, a former undrafted rookie out of SMU, made his NFL debut earlier this month. The lineman started this past weekend’s contest against the Chiefs while his fellow lineman recovered from injury. The Buccaneers should see the return of three lineman this week in Kevin Pamphile, Evan Dietrich-Smith, and Leonard Wester. The additions of Elliot and Allen will briefly fill the holes caused by Adjei-Barimah’s suspension and Gottschalk’s injury. 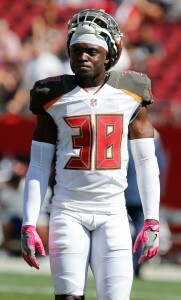 Allen played three games for the Buccaneers back in 2014, while Elliot is a former walk-on for the FSU football team. The duo have spent the entire season on the Buccaneers’ practice squad.